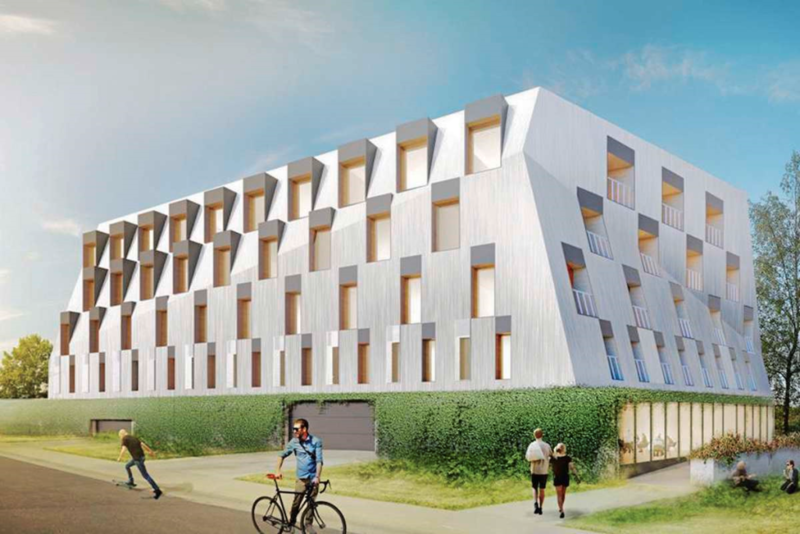 A unique apartment block is being developed in St. Norbert, on the corner of Pembina Highway and Ducharme Avenue which will again increase the population of our community. I expect young professionals, students attending the U of M, and those desiring a unique “city/rural experience” will reside in the building. The pictured design in the recent Sou’Wester article is a PROPOSED concept, and is not yet finalized. I’m working with the developer to ensure attractive landscaping and pedestrian components are included. It’s very exciting to know the ground level floor will contain a coffee shop with seating area on the Boisjoli Coulee (creek). To learn more, you can review the interesting design overview of the complex provided by the developer. It is noteworthy that Terrasse Boisjoli and the new student complex on Pembina are the FIRST two developments in Winnipeg to be approved with a crash wall along the rail line in compliance with the Federation of Canadian Municipalities’ Guidelines for New Development in Proximity to Railway Operations. Also in this area, I have requested that the Winnipeg Public Service conduct a traffic study at the intersection of Pembina Highway and Grandmont Boulevard. With the closure of Waverley Street north of the Perimeter, this intersection is experiencing an increase in traffic volumes. I’m hoping the results of the traffic study will meet the necessary criteria for some type of traffic control device, one which will benefit both vehicles and pedestrians. A novel, Parisian-inspired residential development in St. Norbert is one-step closer to reality following the Riel community committee meeting on Sept. 12. City councillors Janice Lukes (South Winnipeg-St. Norbert), Brian Mayes (St. Vital) and Matt Allard (St. Boniface) voted unanimously to approve a subdivision, rezoning, conditional use, and variances for the Terrasse Boisjoli development at the corner of Ducharme Avenue and Pembina Highway. The proposed development will be six storeys tall, with 40 residential units, one commercial unit on the ground floor, and surface and underground parking available for 56 vehicles. Designed by 5468796 Architecture, the building will feature a modified mansard roof and hooded windows and dormers in keeping with the St. Norbert planned development overlay. The conditional use was needed for the creation of a patio on the ground floor adjacent to the commercial space and variances were required due to insufficient landscaping, parking and side yards under the current bylaw. The property is bordered by the CN Letellier rail line to the west and the Beaujolais coulee to the north. Colin Neufeld of 5468796 Architecture spoke to the committee, stating that the proximity to the coulee and the rail line made for a challenging design process. Terrasse Boisjoli is also the first development to be approved with a crash wall along the rail line in compliance with the Federation of Canadian Municipailties’ Guidelines for New Development in Proximity to Railway Operations, according to area councillors. “We quickly realized it was a difficult lot, being adjacent to the coulee, rail line, and Pembina Highway. There was very little left on the lot once you figured all of that out,” Neufeld said. “What you’re left with is a higher-end version of the development than what was originally proposed. “Structured parking, a crash wall to mitigate the CN requirements which we are doing… and they are onerous. On a lot this size with this size development, it was a difficult financial pill to swallow,” he added. Neufeld also noted that during public consultation, developers heard concerns about parking and traffic, which he believes have been mitigated on the property. However, traffic at the corner of Ducharme and Pembina is an issue that still needs to be addressed by the city. Lukes said the development is an exciting project for the neighbourhood and thanked the applicant for consulting the community throughout the design process. Final plans will be submitted to the director of planning, property and development for approval.